As we know inflation according to the retail prices index (RPI) year on year is currently running at 4.4%. 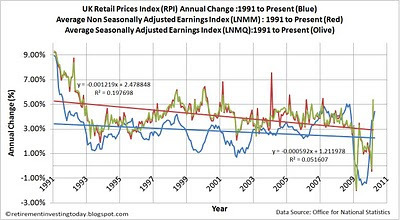 Looking at historic RPI inflation data shows the average year on year RPI annual change since 1991 at 2.8% and the trendline since 1991 shows inflation year on year trending downwards. My chart today shows these RPI figures in blue. I also show the non seasonally adjusted average earnings index (LNMM) in red and the seasonally adjusted average earnings index (LNMQ) in olive. Both of these are also trending downwards but importantly at a rate higher than inflation meaning the gap is closing. Historically the average of LNMM since 1991 has been 4.1% and LNMQ has also been 4.1%. This means the average real increase of UK earnings has been 4.1%-2.8%=1.3%. I sure hope it’s due to point 3 but I don’t necessarily believe that’s the case given what I see in the UK today. I work in private industry and I know that some companies that were on short work weeks are gradually getting back to full weeks. I also know that in my industry it certainly isn’t wage inflation but I’m not sure about other industries. Is wage inflation starting to feed back into the system? If it is then the Bank of England may be playing a dangerous game with their easy money policy.